Our ancestors used shovels and wheelbarrows to build the dikes that kept the sea at bay, most of the time anyway. They were admired for their achievements and their courage throughout the world even though it was never ending back breaking labour. But you could say they had a dream and they had the guts to persevere, in order to transform thousands of acres of salty marshes and waste land into prosperous farms. Until well into the 1950s men carried sacks weighing 200 pounds and thought nothing of it. No, it didn't kill them but a man can carry only so many sacks in a day. They had to load it on their back, get up that ladder, put it down carefully and then stack it neatly. It all took time and energy. We've come a long way haven't we ? On the one hand... We have here in our office a machine that might very well weigh a little more than 40 pounds (20 kg). On the box it clearly warns: "Do not attempt to lift or carry the scanner by yourself. It requires at least two people". That's the lawyers' contribution to progress. The toys Indusign makes do a bit more useful work in an hour than thousands of men with spades, shovels and wheelbarrows could do in a whole year. One of the smaller models can reach out 125 ft (38 meters) to pick up a little something weighing up to 13 metric tons to put it down somewhere else. The largest model has an outreach of 147 ft (45 meters) and lifts a load of up to 43 mtons to put it down up to 213 ft (65 meters) higher up even if these cranes are not meant to help build skyscrapers. All these cranes the Indusign people build in the humble town of Adegem are perfectly balanced thanks to a moving counterweight of between 34 and 185 ton. That makes for smooth operation and less wear and tear. And, get this, at the lowest cost per processed ton in the industry. Indusign is expanding. We believe they're expanding rapidly because they make a great product and they do it with great enthusiasm. If they called in a consultancy firm they might be given a longer list of reasons and a more learned formulation by wised up guys—at great expense—but it might still boil down to the same things: a really great product and the enthusiasm of the lads who build it. This grabber weighs a mere 11.5 ton. On 30 January 2012 the new port of Rotterdam was safe behind a barrage of 19,558 blocs of concrete. These cubes with edge-lengths of two and a half meters (8.2 ft) weighing 40 tons were stacked together with great precision by an E-Crane called Blockbuster. It's been busy day and night with this little job since April 2011 and it finished on time. Allow us now to tell you something about Mr. Rene Hoffmans. We know all about him thanks to the January 2012 issue of Earthmovers Magazine. For more than 40 years Mr. Hoffmans had worked with other excavator machines and the last 22 years he had added to his experience in the dredging business. Then he was approached to work with the E-Dredger, in fact an E-Crane mounted on a self-propelled pontoon acquired by Herbosch-Kiere. 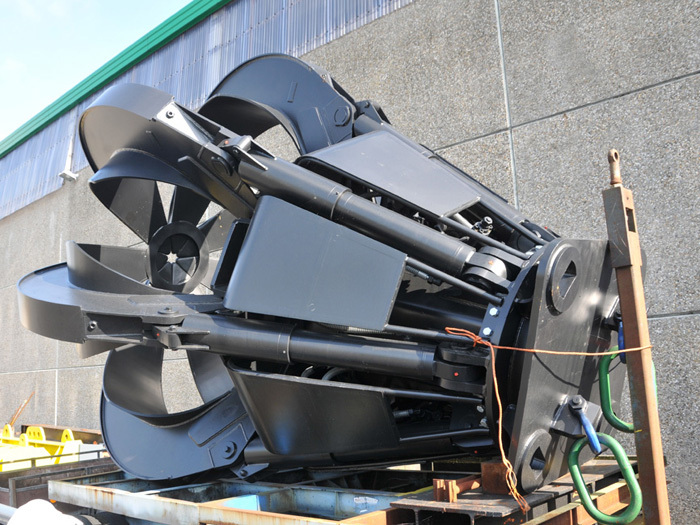 He found the E-Dredger "exhilarating". 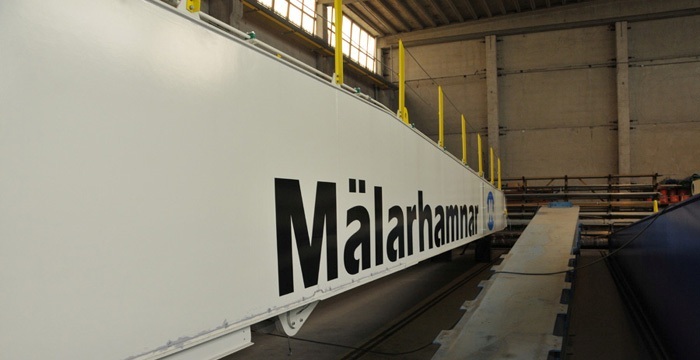 It easily lifts 15 tonnes and swivels with the boom extended to 27 meters. Dixit Mr. Hoffmans: "During 42 years of excavator driving I have to admit that I have never sat on such a fantastic and comfortable machine." We confess perfectly frankly and shamelessly: we're jealous ! He's allowed to play with such a fabulous toy and we're not. And on top of that he gets paid for doing that. It's alright for some isn't it ? Did we tell you already Indusign is in full expansion ? Well, in August 2012 the firm acquired 100% of the shares of Famaba, the Polish steel construction firm that had been their supplier up to then. That meant the number of persons employed by Indusign went up from about 65 to over 350. 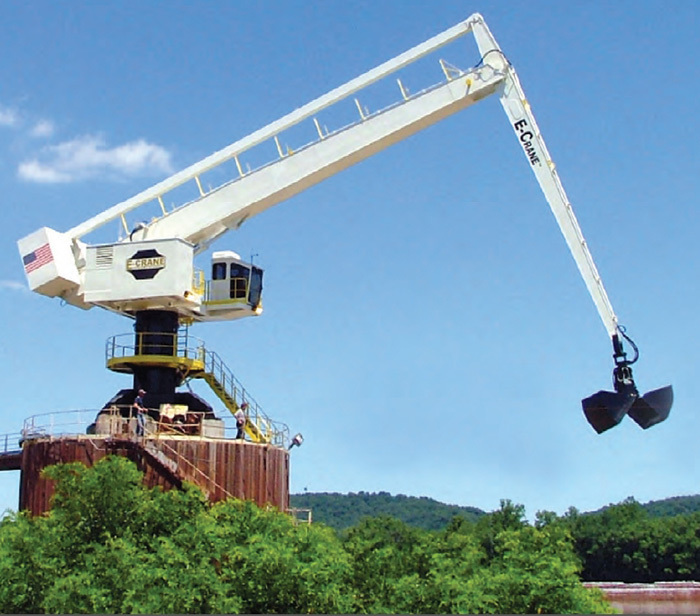 Here on the official E-Crane website you may find a few brochures that explain everything far better than we ever could. After our guided tour of the works in Adegem in August 2012 we still hadn't seen a single operational E-Crane. That was to change with the acquisition of an extra E-Crane by Van Heyghen Recycling N.V. First the inauguration on 16 November 2012 and the next day a popular and very enjoyable fête for the employees and friends of both firms. Earthmovers Magazine is the UK's most popular earth moving and construction equipment publication. Many thanks to ir Lieven Bauwens and to Mrs. Ann-Sophie Degroote for allowing us to make photographs in the workshop and to Mr. Klaas Debrabandere i.a. for the guided tour.